Oklahoma Children's Theatre began as a program of the Stage Center in downtown Oklahoma City. The program was a successful revenue generating program meeting the needs of children and youth audiences. In December 1986, the theatre became an independent non-profit organization with founder, Lyn Adams, named as Executive Director. Ms. Adams operated a resident theatre program at Oklahoma City Community College from December 1986 to August 1989. 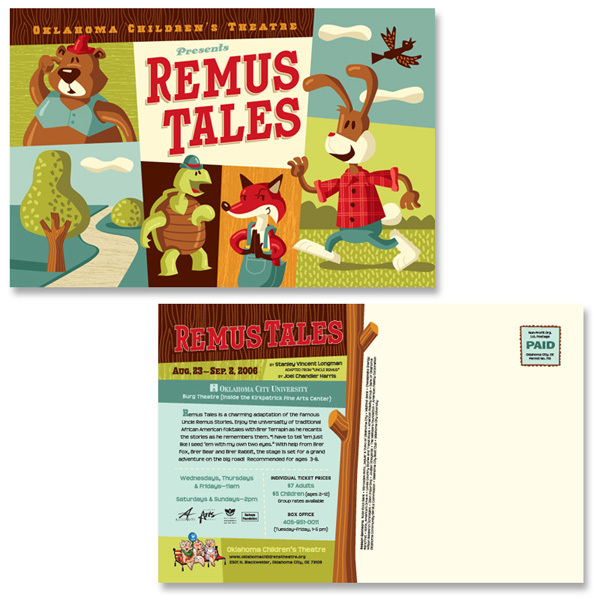 During these three years, Oklahoma Children's Theatre audience grew from 10,000 to over 20,000. In this same period, the theatre implemented a number of additional programs including: Summer Children's Theatre Workshops, Children's Theatre Tour of the Putnam City Schools and a Youth Conservatory Program. In August 1989, Oklahoma Children's Theatre was invited to become a resident at City Arts Center, on the fairgrounds. This move permitted the expandability of productions and educational programs for young audiences to include: main stage productions each year, a statewide touring program, a youth theatre program and an arts collaboration program between Oklahoma Children's Theatre, local daycare centers and community artists. In September of 2005, OCT moved to the Campus of Oklahoma City University, where a very successful collaborations in both performance and educational programming has enabled even more growth. In August of 2007 OCT moved office spaces one and half blocks down the road to a building owned by OCU on the corner of Blackwelder and 25th street. The building has always been known as the Children's Center for the Arts and was the original home of Claire Jones Children's Theatre program. Through significant financial support from the Inasmuch Foundation, it has been transformed into a warm, exciting, versatile, fully functional theatre space for young audiences. Classes and performances are regularly held in the CCA. Fall, winter, spring and summer camps are focused in the space as well as before and after care and home school programs. OCT offers annually 8 in house and 2 statewide touring performances, weekday and weekend after school classes as well as summer, fall, winter, spring camps and teacher/student workshops and after school programming to underserved elementary schools. Estimated annual attendance is approximately 42,500 for all activities. OCU provides space for all OCT programs and in return OCT works with students as performers, administrative support, assistants and more whenever applicable. Oklahoma Children’s Theatre celebrates it’s 30th anniversary! We welcomed Nathan Benfall back as a full time staff member, coming on as Operations and Program Manager. Shortly after we welcomed Mollie Reid back as our Outreach and Education Director. We celebrated our 20th annual Fairy Tale Ball, as well as our 20th anniversary of our first BancFirst tour. We saw a great expansion of Page-to-Stage, which represented the beginning of a new direction for our educational programming, as we began to focus on in-school and outreach programs as our core educational mission. Our Co-production with OCU saw our director Lyn Adams take to the stage, in "Pride and Prejudice". We also debuted our new Christmas show "Junie B in Jingle Bells Batman Smells". Our in-school literacy program Page-to-Stage came to life, as we bought our first show “Teddy Bear’s Picnic” to schools. Nathan returning to Oklahoma for a year, rejoined the OCT team working as an education assistant. He made his OCT acting debut in the Christmas show “A Rough Night at the North Pole” where he played Eddie, the world’s tallest elf. Our afterschool Young Company Program worked along side our adult actors in "The Sugar Plum Fairy" with the fabulous Miss Kaitlyn as Phoebe the fairy. Strengthening our partnership with OCU, we began our annual Christmas Co-production, with "A Christmas Carol", which ran annually until 2012. We also moved to our new offices, where we still reside in the Children’s Center for the Arts, sharing the facilities with OCU’s Moving Image Arts program, and the OCU theatre department. Turning 20 years old, 2006 saw many exciting additions and changes. We presented our first season of summer camps on the OCU campus themed “Peace, Love, & Summer Camps”, where we held 4 classes each week for the 12 weeks of summer. This summer also saw Education Director Mollie Reid, and Operations Manager Nathan Benfall make their teaching debut. We also welcomed our new Education Director Rozz in September 2006, as we continued to expand our program. We began our Afterschool programs with Putnum Heights Elementary, with help from the Oklahoma City Community Foundation. We welcomed our bookkeeper Sherri Blaik to our team. She introduced us to Mattox, who was 3 months old and who cried continuously through our first meeting. He's now in Middle school and has a georgeous little sister Allie. We also created a new partnership with Funnel Design, thanks to a generous re-branding grant from Sarkey’s Foundation. This saw the redesign of our much loved mascots Rose, Scarlett and Fushia, or theTthree Little Pigs. We celebrated forming a new partnership with the Oklahoma Community Service Commission ( now Red River Community Corps), welcoming our first member Lauren Brickman who now lives in NYC and is a Theatre professor and also a really cool theatre company called " Story Pirates".. In March we presented the groundbreaking show “And Then They Came for Me: Remembering the World of Anne Frank” with a touching visit from Eva Schloss of whom the play was about. We also started our partnership with Allied Arts as a member agency. We were excited to welcome Elin Bhaird as our Artistic Director in December. April 1995 saw Elin Bhaird join us with her first show "Gilgamesh". 1995 also saw our first Fairy Tale Ball, our now annual fundraising event. “Cinderella” was held at the First National Center and was chaired by Becky Love. In 1994 Lyn Adams became director of City Arts Center, as well as Oklahoma Children’s Theatre. This helped to strengthen the relationship between these two organizations, and even though they remained separate 501 ( C ) 3 organizations, both organizations worked hard alongside each other, moving to fill the goal of bringing arts to the Oklahoman community. In summer 1991 we added Nursery Rhyme Camps to our summer programming, separating our age groups to 5-7 and 8-12 years . This year we would offer two classes of 15 kids, each week for 6 weeks as well as the three weeks camp "The Emperor's New Clothes"
1990 saw the beginning of our summer week long camp program, with a six-week long Fairy Tale Camp season, where 15 kids each week would join us. Our first three week camp in the newly remodeled theatre at City Arts Center was " The Pied Piper of Hamlin". The air conditioning went down in the middle of the summer and two giant wind/cool air tubes were brought in to help. In August of 1989 OCT moved to the fairgrounds, where we began our partnership with City Arts Center (now Oklahoma Contemporary Arts). Thanks to Chris Keesee, Marilyn Myers and the Kirkpatrick Foundation who made this possible. Our first show in our new location was the "3 Billy Goats Gruff" which had to be presented in the old Panetarium as the Theatre renovation had not been completed. When we brought in three reall Billy Goats, a donkey and a pony to provide a little atmosphere, I am sure Chris and marily both wondered if they had made the right decision to have us live with them at the City Arts Center! Our opening show in the new flexible theatre space was "Bah! Humbug!" Nov 7th 1986 we received our Certificate of incorporation, officially registering us as Oklahoma Children’s Theatre. Our home was Oklahoma City Community College, where we presented our first season of "The Mirror Man", "A Christmas Carol", "The Porker Sisters", "Rapunzel", "The Velveteen Rabbit", "Treasure Island", and "Charlie and the Chocolate Factory". Production Photo, Toby Tobin & Kelly Riha in " Puff's Magic Tail"